I was thinking to make poh-piah for dinner, but then I suddenly thought of those homemade giant meatballs sitting in the freezer. So, why not save myself whole bunch of mad prepping and go for much easier food option. 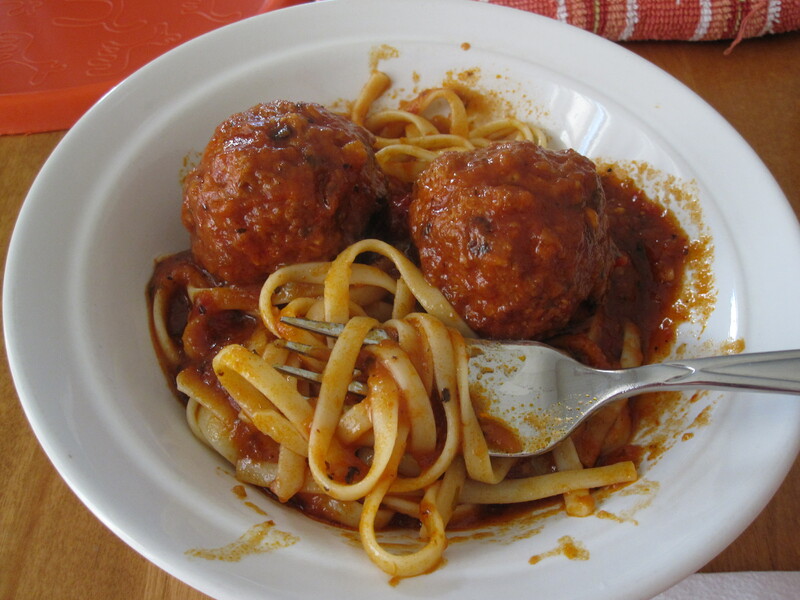 Plus, Alexander has been wanting to have spaghetti with meatballs for dinner for some time now. I didn’t have spaghetti so I used linguine instead. Saute garlic briefly in a deep pot. Place in meatball to form one layer loosely. Add chicken broth and pasta sauce (pepper flakes too if desired), stir to combine. Be sure the sauce covers the meatballs. Cover and boil on high heat for 10 minutes. Stir occasionally so meatballs won’t stick to the bottom. Turn heat down to medium low to simmer (the sauce will still be bubbling) for 2-3 hours, until meatballs are tender and sauce is thicken. Be sure to stir every 15 minutes or so to prevent meatballs from sticking to the bottom. Add salt to taste. Serve with linguine or French bread.